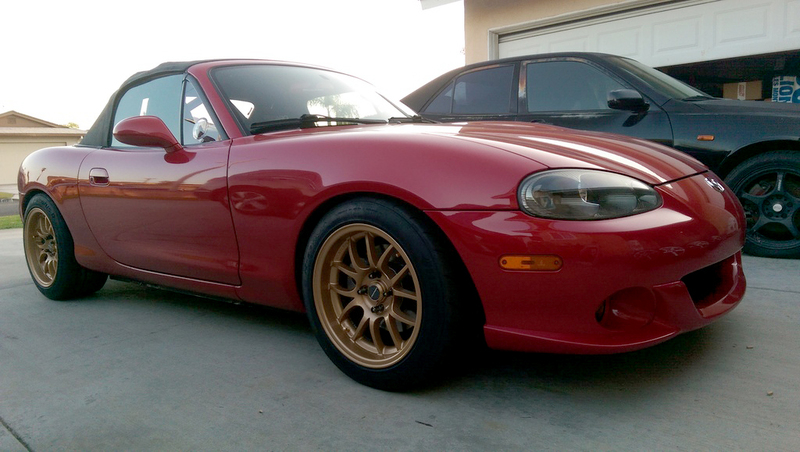 Having added a few new cars to our project car fleet lately (more on those soon), and with wide fenders going on the S2000, we’ve been doing a lot of wheel fitment research lately. The problem with researching this subject online is the definition of “does it fit?” varies a lot from person to person. 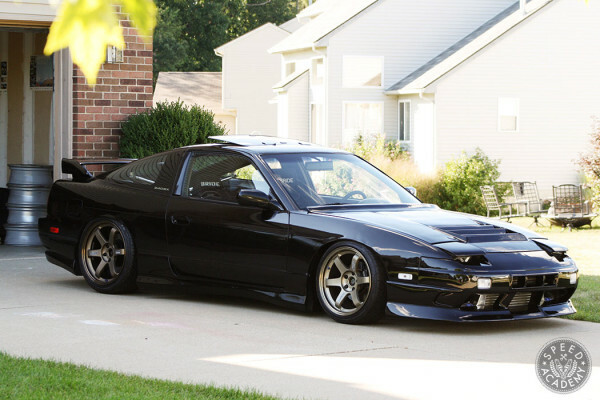 The Stance dudes think anything fits with enough camber and enough fender pulling, while grassroots racers like us tend to have a stricter definition since we’re focused more on functional wheel alignment and full suspension travel and steering angle without fender or wheel well or control arm contact. That said, as we proved with the ASS2000, we’re not afraid to aggressively roll and pull fenders to fit wider wheels and tires in the name of more grip and faster lap times. But since we’re putting some Downforce USA +30mm front fenders and ASM +25mm rear over-fenders on the car, we really need to nail the offset of the 17×10” wheels we’re planning to order this winter if we want to avoid putting a hurting on these. 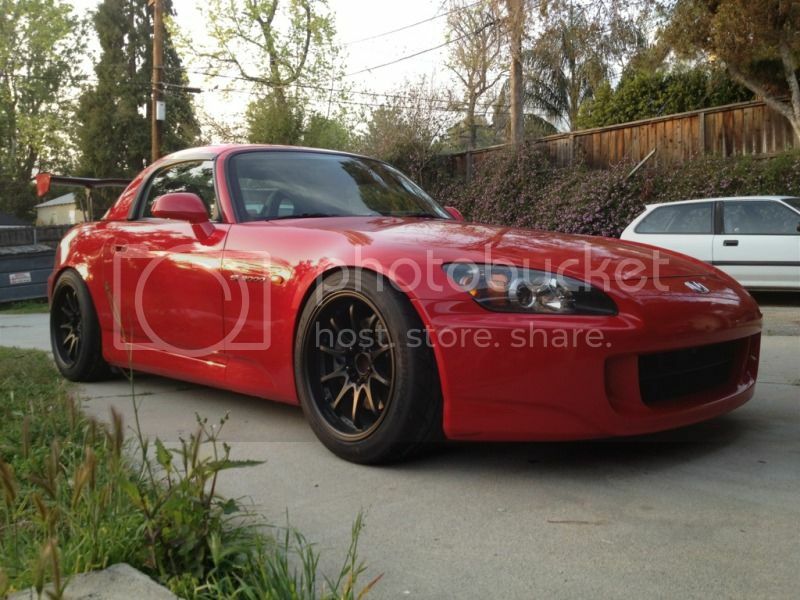 The idea is, after all, to make the S2000 as pretty as it is fast while also allowing us to fit an even wider set of wheels and tires. 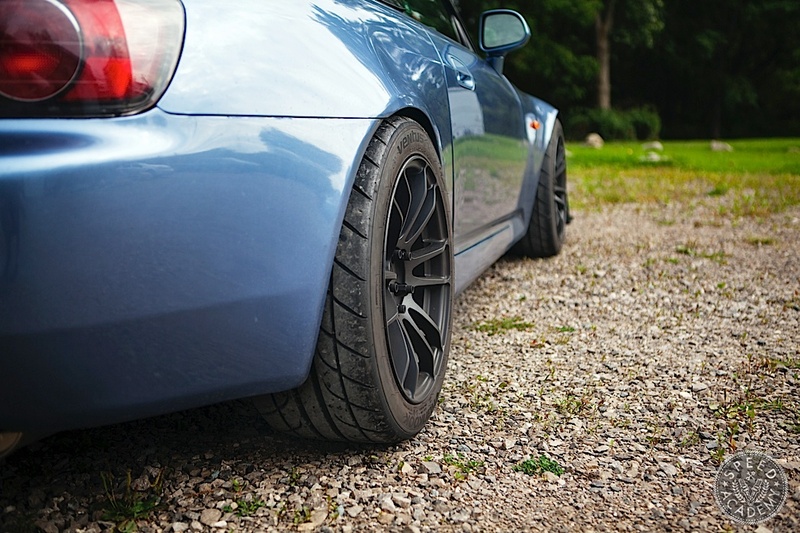 Point being, selecting the right wheel size and fit for your car is absolutely critical if you’re trying to maximize performance and minimize clearance issues with the fender lips and within the wheel wells. But before we get to some practical guidelines for selecting the best wheel fitment for your car, lets quickly review what wheel offset, back spacing, bolt circle diameter (or PCD) and center bore are so that you can better make sense of the ways wheel manufacturers list their products. Wheel offset if the first place most people start when selecting new rolling stock for their street car or track car, and for good reason. 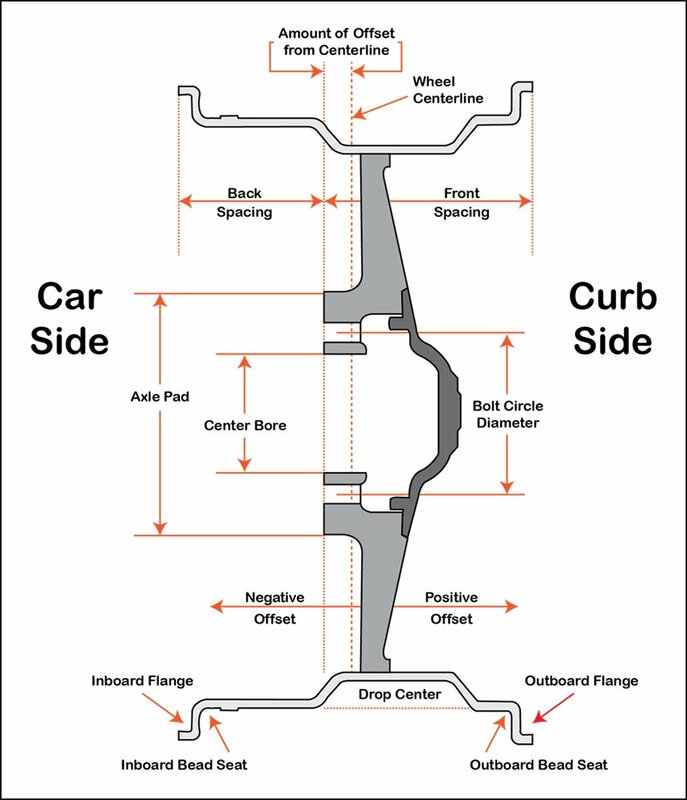 As the diagram above illustrates, offset is a measurement of how far inboard (negative offset) or outboard (positive offset) the back of the wheel’s mating surface (axle pad) is from the wheel’s cross-sectional centerline. To achieve that deep dish or concave face everyone wants on their wheels these days, you either need a wheel with less positive/more negative offset or you need a wheel that has a spoke design with some outward curvature that creates the illusion of concavity. Measuring offset yourself it quite easy, but also keep in mind that most wheels have the offset cast or stamped into the backside of the wheel somewhere, often on the back of the spokes or axle pad. 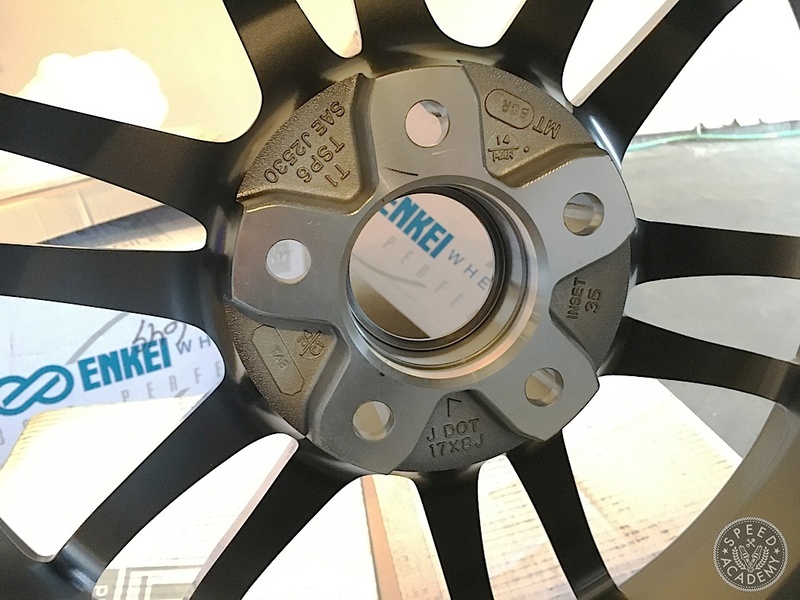 As you can see above on an Enkei TSP6 wheel the size is cast in the back of the axle pad with a 17x8J (meaning the wheel is 17” in diameter and 8” wide) and the +35mm offset is cast in where it reads ‘Inset 35’. But lets say you’re looking at buying a used set of wheels and the sticker or casting mark with offset information is missing. To determine offset you start by measuring backspacing by taking a measurement from the inboard flange or inside lip of the wheel to the back of the axle pad on the flat surface where the wheel would sit flush against the hub when bolted down. This distance gives you your backspacing. 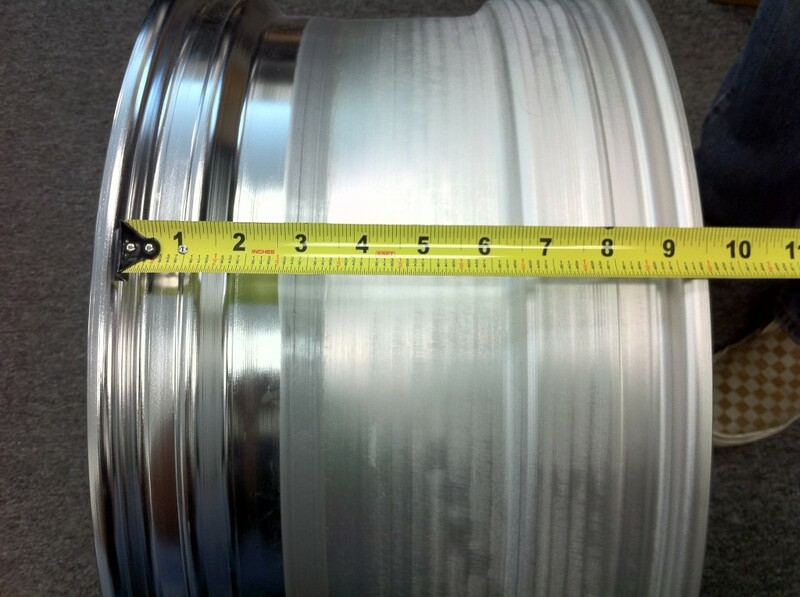 Make sure to measure from the flange, not the bead lip which often pokes out further than the flange. Next you need to take a measurement of total wheel width by simply measuring the distance from the inside of the inboard and outboard lips or wheel beads. This is critical to get right, since if you measure from the outside of the wheel bead you’ll get too wide a measurement and this will throw off your offset calculation. Once you’ve correctly measured wheel width, divide this measurement by 2 to get the wheel’s centerline. So on the 9” wide wheel above, the centerline is 4.5”. To calculate offset, now all you need to do is subtract the centerline measurement from the backspacing measurement. So if the backspacing measurement is 5.88” and the centerline is 4.5”, then you’ve got a a positive offset of 1.38” or 35mm, just like those Enkei wheels were marked with. Congrats, you’re now an offset calculating ninja! The other measurement that’s important to consider when shopping for wheels is bore center. This is simply the diameter of the wheel’s center bore that is meant to be seated on the hub so that the wheel is perfectly centered and balanced forzero vibrations at speed. You can use centering rings to fit wheels with larger center bores than your vehicle’s hub diameter, but be sure not to buy wheels with a center bore smaller than your hub diameter because in most cases you really shouldn’t have the wheel’s center bore machined out to a larger diameter because this will compromising its structural integrity. And of course you also need to have the correct wheel bolt circle or bolt pattern for your vehicle’s hubs, since changing the hub bolt pattern requires swapping hubs or using hub adapters, both of which are expensive and impractical in most cases. As you can see from the image above, bolt pattern is simply the distance between bolt holes or stud holes on opposite sides of the wheel. 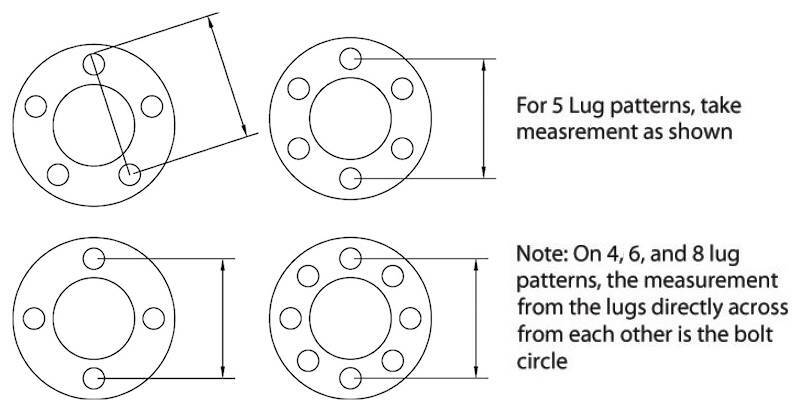 Note that in the case of 5-lug wheels you measure from the center of one bolt hole to the backside of one of the opposing bolt holes. Ok, so now that we’ve covered wheel anatomy basics, lets take a quick look at how wheel diameter and wheel width effect performance. Wheel diameter can have a major impact on fitment, since a larger diameter wheel than the car was designed for can sometimes mean you’re stuck running a “taller” tire (greater overall diameter) because you can’t get a tire with a low enough aspect ratio (or short enough sidewall). 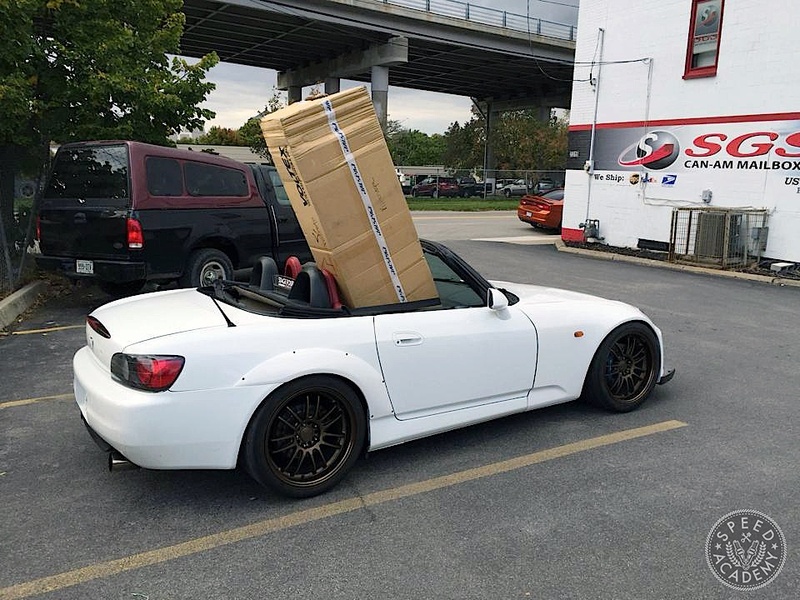 This will result in the car either having a raised ride height, or if you lower it to compensate you’ll end up with reduced fender to tire clearance. Plus a taller tire has the effect of lengthening gearing, which hurts acceleration but helps top speed (not a good trade-off since you do a lot more accelerating than you do top speed runs). So be sure to factor in the overall diameter of your wheel and tire package when considering how much rubber you can stuff under the stock fenders and try to keep the overall diameter the same or even slightly smaller than stock if your focus is on performance. 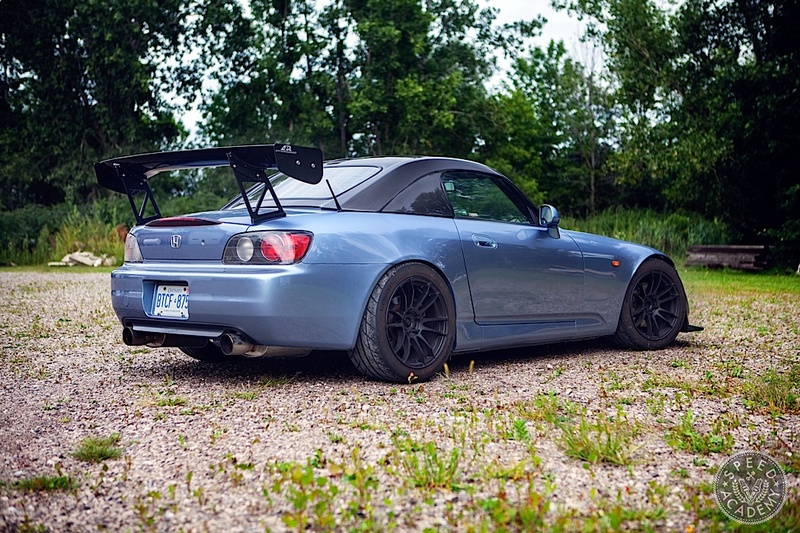 Or just stuff some chrome 22’s under your S2k and call it a day. The choice is yours. 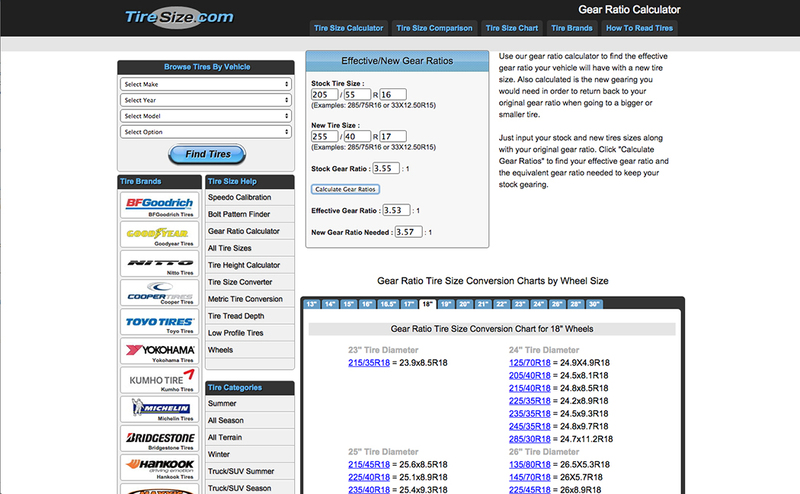 Here’s a handy dandy tire size gearing calculator that shows the effects of changes in tire diameter on gearing. Play around with this a bit and you’ll see what I mean about a taller tire changing gearing. Wheel width can have a surprisingly large impact on performance too, especially tire performance since a wider wheel will effectively widen the tire’s contact patch and will also put some tension into the sidewalls which helps sharpen turn-in response and reduces sidewall deflection and contact patch distortion. In fact, a number of reputable sources have tested increasing wheel width on the same size tire and found that for every inch of wheel width added, lap times are reduced by about half a second per minute of elapsed time. Of course there are a lot of variables at work here, including the track itself, the tire in use, suspension and alignment setup, etc. But in general and within reason, a wider wheel will deliver better tire performance, and nothing matters more than tire performance when it comes to turning faster lap times. 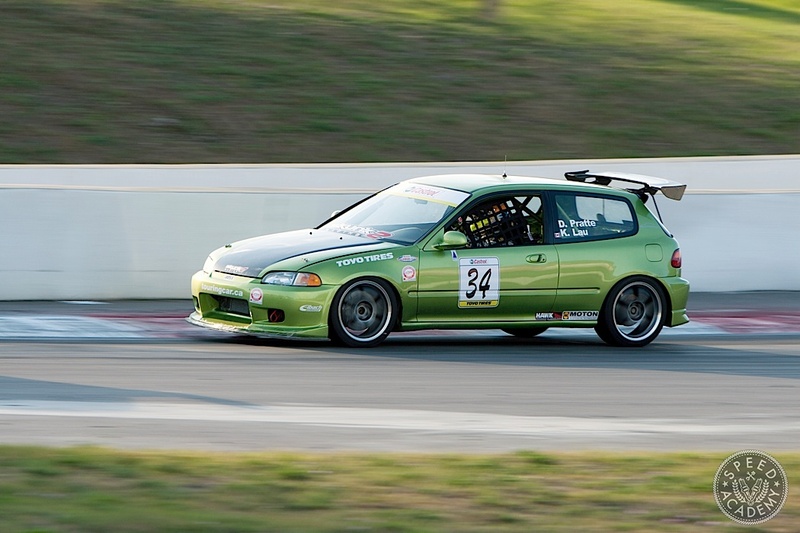 A more aggressive (less positive) offset also has its advantages, since this pushes the wheels and tires out further and effectively widens the track of the vehicle. As I learned when experimenting with wheel spacers on my CTCC Honda Civic, even a 5mm spacer on the front wheels can noticeably improve front grip and change handling balance too (in either a negative or positive way, depending on how the rest of the car is setup), so be prepared to do some fine tuning of your suspension settings if you start to make changes to track width via more aggressively offset wheels, especially if you just widen track width across one axle. Ok, so it’s finally time to bust out the tape measure and figure out how much wheel and tire you can fit in your wheel wells. I like the L-square ruler approach like you can see in the image above as an easy and fairly accurate way to measure out from the face of the hub to the fender lip as well as back into the wheel well. It’s important to have the hub in a position that simulates the car being on the ground, so I use a floor jack to raise the knuckle to the position it would be in if the suspension was under load. To check for points of contact within the wheel well including steering and suspension arms, clamping a straight edge to the L-square is an easy way to get a consistent measuring point to work from. For the front end, be sure to move the steering through full lock in both directions and again be sure to have the hub in a position that simulates the suspension being under load. As a general rule you want to have at least a 1/4” to a 1/2” of clearance to anything in the wheel well, since compliance or squish in the suspension bushings and movement of the tire under load means that clearance you thought you had can suddenly disappear under real world driving conditions, especially the high loads the bushings and other suspension joints on the chassis see at the race track. 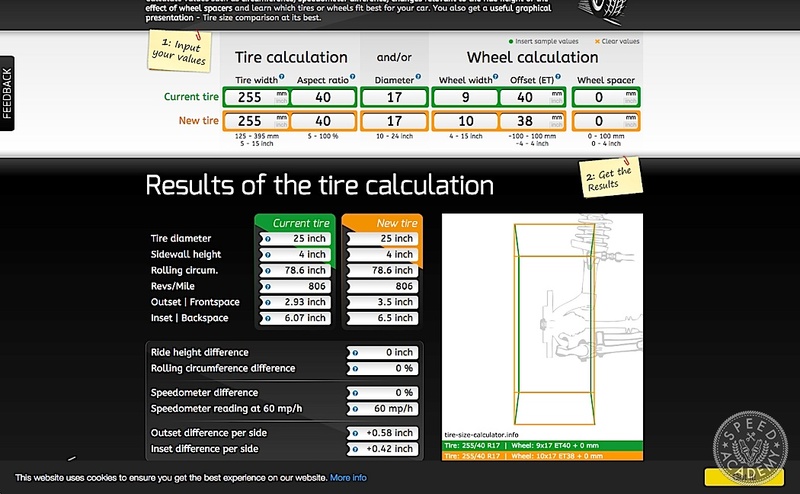 Here’s a link to an excellent wheel and tire size calculator that gives you a visual representation of the size of the wheel and tire package and how changes in wheel width and tire diameter change the space used up by them. 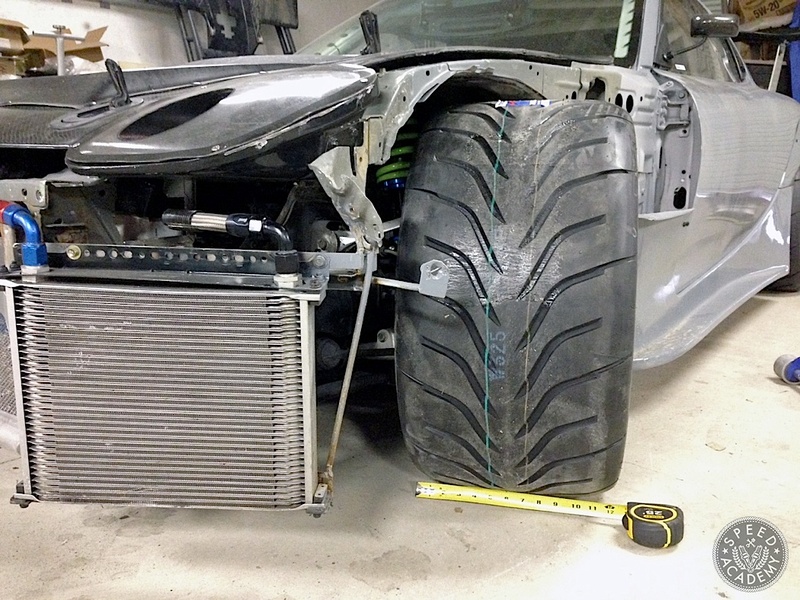 So if you’ve taken measurements and have a good idea of what will fit, playing around with this calculator can help you dial in on a wheel and tire package that maximizes grip without fouling on the fenders, chassis or suspension. If you’re willing to spend $80 for a tool specifically designed to measure wheel and tire clearances, check out the Percy’s Wheelrite tool. Above is a video showing you exactly how it works. If you’re not confident in measuring clearances with a L-square, measuring tape plumb bob, and/or straight edge, then buying a Wheelrite tool may be your best option for avoiding an expensive wheel purchase that doesn’t fit your car. Cross-referencing your measurements with information on your favorite online forum isn’t a bad idea either, but we’d certainly recommend focusing on what the guys/gals in the Racing/Autocross/Time Attack forums say fits and try to focus in on wheel and tire setups that real competitors use on their track cars with no clearance problems to report. 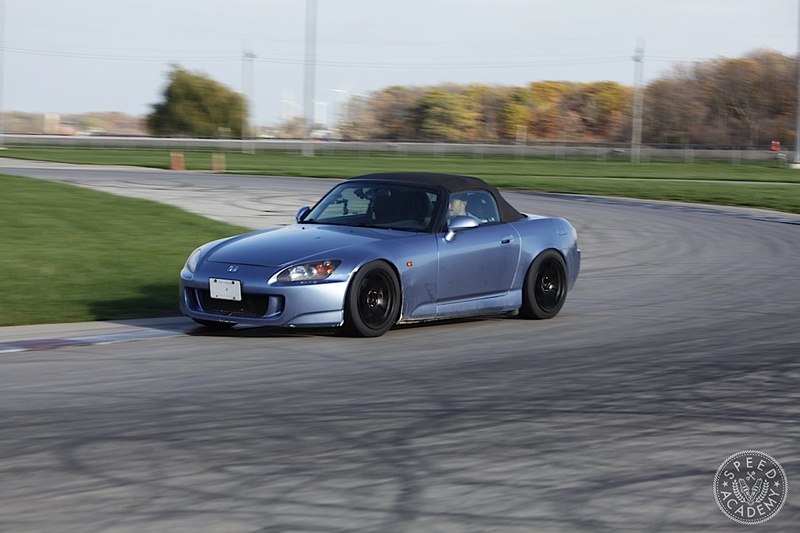 The Internet told us our 17×9 +40 Gram Lights with 255/40R17 tires would fit the S2000 without having to do any crazy pulling of the fenders, but we learned the hard way that serious rolling and pull was required, at least at the ride height and camber settings we settled on. These 17×10 +45 Volk Racing CE28N‘s clear everything in the wheel wells, but as you can see the fenders have been rolled and pulled a fair bit for clearance on the outboard side. How will they fit with our over fender setup? Our friend Chris is running the same over fender combo we’re going to be, and his 18×9.5 +35 Volk Racing RE30’s appear to fit quite well, but he told us the front fenders needed to be trimmed along the fender lips to stop the rubbing. Pictures on the Internet can be deceiving, so we’ll be test fitting our over fenders, taking some measurements, and perhaps using some of our 5×114.3 wheels and tires from around the shop to see if we can hit on a wheel width, offset and backspacing, and tire size that we’re confident will work. Expect to see a video an a story on this process sometime this winter. Understanding Offset, Backspacing, Bore Center and More!" Excellent article. But that’s a given because you guys actually give technical info here. Anyway, for anybody that prefers a visual aid when checking how offset and width effects a wheel I like http://www.willtheyfit.com It’s a little more useful to me if I need to show a customer what is going to happen when we change from their factory wheels to an aftermarket set. I appreciate you defining why it’s important to pick the right size wheels for your car’s performance and supplying pictures about those things. I am currently looking for new tires and am trying to find the right size for my car rather than just the most affordable size. I think that it’s wise to have tires that fit your car so you can get the most out of your performance as well as avoid annoying tire on frame issues.